Neil Melanson is the head submission grappling coach for Xtreme Couture, Las Vegas and was kind enough to take part in an interview I conducted ahead of Randy Couture‘s UFC 129 bout with Lyoto Machida. Much will be written about Randy Couture over the next couple of weeks as well as the main event of Georges St Pierre vs Jake Shields. Rather than talking about the specifics of Couture’s fight with Machida I decided to put the focus on Melanson as an opportunity to find out more about him and some of the other fighters he coaches, as well as address some of the controversy surrounding him among the online grappling community. Gil Martinez, Randy Couture and Neil Melanson after beating James Toney at UFC 118. Photo by Tracy Lee for Yahoo Sports. KJ Gould: Firstly Neil, thank you for agreeing to take part. Neil Melanson: Thank you for having me KJ. KJ: Some MMA fans, and UFC fans in particular are beginning to recognise you as Randy Couture’s grappling coach but are otherwise unfamiliar with you, your training in martial arts and your background in general. You notably trained at Gokor Chivichyan’s Hayastan Academy and spent a lot of your time learning under former UFC Welterweight Karo Parisyan. How many years were you there for and how much of your training was done with Karo and Gokor? NM: I was at Hayastan for 3 years or so and I was training with Karo for the majority of the time if not all of the time. I continued to train with Karo for the next few years after that. KJ: Was your training in the no-gi style of Hayastan Fighting Systems only or did you learn Judo in a Gi as well? NM: I never learned Gi, but Karo taught me his no Gi Judo style. I never got good at Judo. KJ: What rank did you achieve and what was it in? NM: I got a black belt under Karo Parisyan in his version of the Hayastan Grappling System. KJ: Gene LeBell, fondly known as the Godfather of Grappling and known for his Judo and work as a Hollywood stuntman, was instrumental in Gokor Chivicyan’s development at a martial artist and still teaches to this day. What are your thoughts on Gene and how much training did you do with him? NM: I trained with Gene when he would teach classes at Hayastan. I think that he is a legend and he is someone I’ve always idolized. KJ: Gene LeBell was also a Professional Wrestler for a number of years and learned Catch Wrestling from legends such as Lou Thesz, Ed Lewis, Vic Christy and Karl Gotch. Is it this mixed in with Judo and Sambo that forms the basis of what Gokor Chivichyan teaches at Hayastan? NM: Yes. Yes it is the main influence and it had a massive influence on me as a grappler. KJ: While working as an Air Marshall you contracted Behcet’a Disease. If you wouldn’t mind, tell us what it is, how it can be caught / how it develops, your personal symptoms with it and your current treatment for it. NM: I didn’t contract it. It was something that I was born with. Behcet’s is a rare autoimmune disease that results from damage to the blood vessels throughout the body. I currently get infusions of a medication called remicade every 6 weeks to keep myself from losing the vision in my left eye. KJ: Due to the nature of Behcet’s Disease, and losing sight in the right eye you were unable to pursue a career as a professional MMA fighter. Before you were effected by Behcet’s did you manage to have any fights (amateur or pro)? 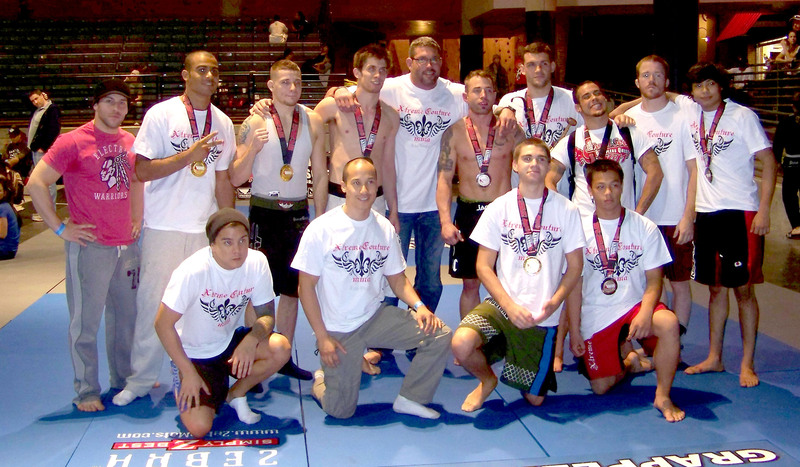 Are you still able to compete in grappling only competition despite living with Behcet’s? NM: No. I would like to compete if my health would allow me to, but my doctors have put pressure on me to quit the sport completely. KJ: With Behcet’s changing your circumstances you’ve focused on becoming a grappling coach. You’ve mentioned in other interviews you became Karo Parisyan’s coach after he had coached you. Was that on the technical side of coaching, the Strength & Conditioning side or Cornering? NM: I helped Karo with strength and conditioning and I was his sparring partner. As I developed, I started helping him with some ground work. KJ: Tell us how you ended up becoming Randy Couture’s grappling coach, and the head grappling coach at Xtreme Couture? NM: I was in Vegas doing a photo shoot at Xtreme Couture and the people who worked there let me know that there was a position becoming available. I applied for it and got it. I worked there for about 6 months before Randy started training with me. Randy started training with me for the Nogueira fight and ever since then, I became his head training coach. KJ: Some of the Xtreme Couture fighters also train at Cobra Kai Jiu Jitsu and continue to train with Robert Drysdale. Do all of the Xtreme Couture fighters train with you or only some? Which fighters train with you the most aside from Randy Couture? NM: I teach pro class twice a week, so I do work with every fighter at the gym to a certain extent, but I do have a select group of fighters that I train consistently on a private basis. The pros who train at the other gyms were doing so before I got here. I have no problem with them being loyal to their other coaches. My style of grappling and coaching is not for everyone. I wouldn’t even have the time to train all of them due to health reasons. I train Vitor Belfort, Ryan Couture, Gray Maynard, Michael Chandler, Dennis Davis, Jason Trevino, Nik Fekete, Jay Hieron, Frank Trigg, and Ray Sefo. I have a lot of fighters who fly into Las Vegas to train with me. Some of those fighters are Chael Sonnen, Mike Pierce, Jake Ellenberger, and Kamal Shalorus. KJ: You say you consider yourself a Catch Wrestler and teach Catch Wrestling based grappling. What is Catch Wrestling to you? Is it a set of techniques, or is it more conceptual and strategy based? Can anyone claim no-gi submission wrestling as Catch, or is there more to it then that? NM: It is more conceptual I would say. The current grappling that we see today is not catch wrestling. It is submission grappling. True catch-as-catch-can is in many ways a lost art. There aren’t too many catch coaches left. I don’t consider myself a true “catch coach.” I just favor it. KJ: You’ve also said previously you’ve become adept at or mastered guard systems and specialise in triangle chokes, which are most often found in Brazilian Jiu Jitsu. What guard systems in particular have you incorporated into your game? NM: I’ve developed many guard systems to deal with the challenges that my opponent gives me based on his hand fighting and body position inside the guard. When my book comes out, you will see exactly what I am talking about. KJ: Who did you learn your guard games from and for how long? NM: Nobody. Karo told me that I needed to master the guard because of my body type and I did what he told me to do. KJ: Do you have a ranking in BJJ or other arts? NM: I have a black belt from Karo in his discipline. NM: I believe that the turtle is the future and I stress it very much to fighters. KJ: What do you believe are the benefits and advantages to working this position? NM: My ground fighting style is completely based on ground fighting in a mixed martial arts contest. Working the turtle allows us to use the rules in our favor and protect our chin from getting hit. The turtle to me is an offensive position. When I am in turtle, my focus is sweeping and reversing my opponent. KJ: Is your focus on attacking the turtle, or turtling yourself, or both? NM: Both, but I spend more time fighting from the turtle. KJ: One of the key topics of discussion recently, particularly among Brazilian Jiu Jitsu players, was your awarding of Randy Couture’s blackbelt after his victory against James Toney. Was that something you had planned on doing for a while, or was it an on-the-day, spur of the moment thing? NM: I was going to give Randy his black belt two months prior to the event, but I wanted to do something nice for him and present it to him in front of the world. He deserves it and needs to be recognized for his accomplishment. KJ: You’ve recorded a video on Youtube explaining your own in-house ranking of your Catch Wrestling based grappling system that you teach. It’s a stripe system to go on shorts at Xtreme Couture using the same colours as BJJ belts. What made you decide to use BJJ colours? NM: The reason why I used the colors was to keep grappling unified under the most common understanding, which is BJJ Ranking. I did this ranking system to help the gym and it’s members. I’ve gotten a lot of criticism for this, but I don’t care. It’s all about my students and not about making everyone else happy. I gave Randy a belt just so he would have something to hang up or put away. KJ: Despite saying you like the BJJ colours as a method of ranking and you’re paying a compliment to BJJ, there are some who complain it’s an attempt to ‘cash in’ on the success of BJJ, and some have been pedantic enough to say you shouldn’t have given a blackbelt to Couture because he doesn’t train in a Gi. What would you say to people with these concerns? NM: I’m not the only one giving belts for no Gi Grappling. I’m not making any money off of this ranking system. I am trying to give my students what they deserve for their hard work. I’m a legitimate black belt with a legitimate background. I train some of the best fighters walking around today. If that doesn’t count for something, then I don’t know what else to say. KJ: I’ve noticed a lot of the media covering MMA assume you’re a Jiu Jitsu coach and that you gave Randy Couture a blackbelt in BJJ. Are you finding yourself, or is Randy finding himself correcting the media at every turn? Is it a slow education process for them, or has it been easier to let them assume because BJJ is the norm? NM: I try to correct them, but over time I’ve lost interest because it’s not worth explaining. KJ: For the record, do you want to be known as a Catch Wrestling coach or a Grappling Coach or … ? NM: I consider myself a ground fighting coach. I teach a lot of striking on the ground and that is an art in itself. I like catch wrestling. My coaches were catch guys, so I support catch wrestling, but I still study BJJ because it has a lot to offer. KJ: A few months before the James Toney fight you hosted a seminar at Xtreme Couture through Scientific Wrestling with Billy Robinson, another legend of Catch Wrestling originally from Manchester and Wigan in the North of England who has trained the likes of Kazushi Sakuraba and Josh Barnett. Also in attendance were Chael Sonnen, Jake Ellenberger and Randy Couture. What was the seminar with Coach Robinson like? NM: Billy Robinson is a walking legend. I really enjoyed listening to him talk. He showed me great techniques always focusing on using little energy and he had very interesting grips that he was using. It was an honor for me to have him here. KJ: I’ve just mentioned Chael Sonnen. You worked with him very briefly before his fight with Nate Marquardt as it was the same event Randy Couture was fighting Mark Coleman at. At the post fight press conference Sonnen complimented you as a coach and said he would bring you in for his training camp in the run up to the Anderson Silva fight. Did you get to work with Chael for that fight? NM: Yes. I trained him for a few weeks. KJ: What did you make of the fight when it happened, and what did you make of Chael’s performance? NM: I thought that Chael did a great job and he annihilated him, but when he was fatigued … he made some mistakes and Anderson capitalized. I was very sad. KJ: Would you like to work with him for the rematch, or has he made any request for help training for a rematch or future fights? NM: Any time he needs me. I would love to train him again. KJ: There’s a WWE wrestler called Daniel Bryan, or known in real life as Brian Danielson who has blogged about training with you at Xtreme Couture. How did that come about? NM: I’ve been teaching him for a few years now. He’s become a very good grappler and he is a very good friend. KJ: He says you showed him something called the LeBell Lock which he now uses as a finisher in Professional Wrestling. What exactly is it, and does it work in real fights? NM: It’s similar to an Omoplata Shoulder Lock, except it incorporates a cross face. This keeps your opponent from rolling out and it can snap the neck and the shoulder. KJ: Speaking of Pro Wrestling, Catch Wrestling is the forefather of both Professional Wrestling as well as American Folkstyle wrestling which is taught throughout the school systems and college. Do you think Catch Wrestling could ever make a resurgence as a legitimate competitive sport, with pins and submissions? NM: Yes and I support it 100%. I’m even hosting tournaments with catch rules. Right now they are just for members, but once I iron out all of the kinks, we are going to do this for everybody. KJ: Is that something yourself and Randy Couture are in favour of (seeing competitive catch wrestling make a come back)? KJ: Are there any difficulties in re-establishing it as a sport and not having it confused with the worked, showcase style of Professional Wrestling? KJ: Thank you very much for your time Neil. You have a book on triangles coming out this year through Victory Belt. Tell us a little about that and anything else you’d like people to know about for the near future. NM: My book is called Mastering The Triangle. It should be out in the next couple of months. I plan on trying to do as many seminars as I can to promote my concepts in ground fighting and my Triangle Book. Any gyms that are interested should contact me through facebook or www.neilmelanson.com. I want to thank the support that I receive from my sponsors. Those sponsors are XCAP Supplements and 5 Star Clothing. The Irish collar is one of the many positions that Xtreme Couture instructor Neil Melanson teaches. Neil’s approach to no-gi grappling is one of a kind, and fighters like Randy Couture and Vitor Belfort have recognized the value of his talent and innovations and have come to him to take their grappling skills to a new level. Neil’s introduction to the Irish collar is broken into three parts. Only 13,000 documented cases of Behcet’s disease exist in the United States, and one of them belongs to Neil Melanson, the head grappling coach at Xtreme Couture Mixed Martial Arts in Las Vegas. The rare autoimmune disorder has already left the 33-year-old Sturbridge, Mass., native blind in one eye and deaf in one ear. He rises each day knowing it has the potential to be his last with the ability to see and hear. Chronic pain — Behcet’s can result in lesions and various ulcerations — remains a constant companion for Melanson, who, despite being born with the disease, spent seven years in the Navy and also served as a post-9/11 federal air marshal. No known cure exists for the disorder, and the effectiveness of treatment can vary from person to person. In Behcet’s patients, an overactive immune system fails to recognize various parts of the body and attacks them as a result. Physical exhaustion and stress can trigger flare-ups, some subtle and some severe. Melanson went completely blind in both eyes for two months back in 2005. Because Behcet’s was so uncommon, he had difficulty finding doctors to diagnose and treat him. Desperation moved in. Eight weeks felt like eight years. At the age of 28, he had resigned himself to the fact that he would never see again. Few realities bite so deeply. Someone else was watching over Melanson, too. Had Melanson’s condition gone untreated much longer, permanent blindness would have set in, and life as he knew it would have come to a standstill. “Once it’s triggered, the damage can be irreversible,” he says. “Right now, I can drive. I can lead a normal life. But if my disease were to trigger, there’s a chance my right eye wouldn’t recover, and there’d be a massive lifestyle change. I wouldn’t be able to do a lot of things for myself.” (above). Doctors placed Melanson on Remicade, an experimental treatment for those afflicted by Behcet’s. The drug, administered intravenously every six weeks, worked wonders for him. Still, the threat of blindness hangs over him. Only his closest confidantes — professional fighter and wife Erin Toughill chief among them — understand how strongly that fear runs within him. It never leaves. As one might suspect, the disease has thrown a wrench into his professional life, as well. Having trained extensively under UFC veteran Karo Parisyan and famed judo guru Gokor Chivitchyan at the Hayastan Studio in California, Melanson arrived at Xtreme Couture in 2008. He has to strike a constant balance between fulfilling his duties to one of the world’s most prominent MMA gyms and keeping himself healthy and out of harm’s way. A former power lifter, he can no longer hit the weights, as the risks associated with overexertion far outweigh the benefits. Melanson even avoids jogging. Despite his limitations, Melanson has earned the admiration and respect of UFC hall of famer Randy Couture — the man who pegged him to replace 2007 Abu Dhabi Combat Club Submission Wrestling World Championships winner Robert Drysdale at Xtreme Couture. The two struck up an immediate kinship. — Melanson on Behcet’s disease. The move to Xtreme Couture forced Melanson to expand his horizons in teaching and coaching the martial arts. Hurdles in a gym of that size are many. Randy Couture and Neil Melanson are introducing a new No-GI / Submission Grappling “Color Stripe” ranking system for our students (youth and adult) and Xtreme Couture fighters. Brazilian Jiu-Jitsu is not the end all be all. Submission Grappling / Catch Wrestling is its own art form. Practitioners don’t wear a gi and, more to the point, have no universal means to track their progress and be ranked by skill level. The simple fact is no one has thought outside the “ Belt ” , until now! Under Neil Melanson’s system and instruction you’ll be able to test out and be ranked as a Submission Grappler / Catch Wrestler. We have a ranking system in place for both adult and our growing youth program. Our youth program also includes reward patches at no cost to you. 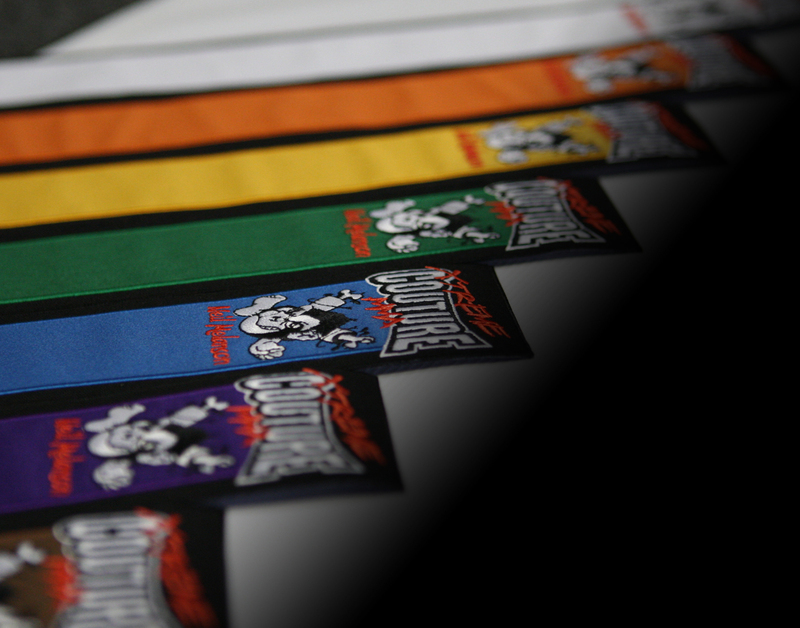 These reward patches are given at levels obtained between a belt. This keeps our youth students eager to progress to the next level. If you have more questions about our program and stripe test and cost, please stop in and visit the gym, you’ll like what we’re doing! Xtreme Couture grappling coach Neil Melanson to discuss Randy Couture‘s submission of Mark Coleman at UFC 109.